Children born between 1 September 2014 and 31 August 2015 are due to start primary school in September 2019. 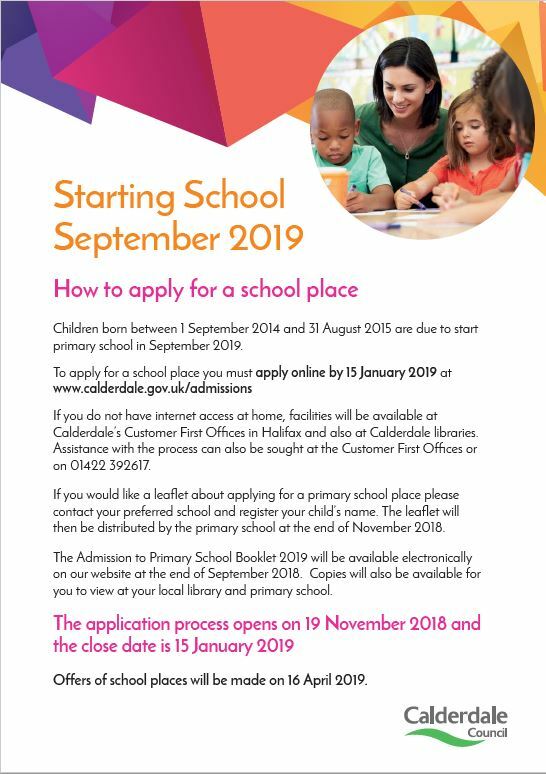 To apply for a school place you must apply online by 15 January 2019 at www.calderdale.gov.uk/admissions. The application process opens on 19 November 2018. If you do not have internet access at home, facilities will be available at Calderdale’s Customer First Offices in Halifax and also at Calderdale libraries. Assistance with the process can also be sought at the Customer First Offices or on 01422 392617. If you would like a leaflet about applying for a primary school place please contact your preferred school and register your child’s name. The leaflet will then be distributed by the primary school at the end of November 2018. The Admission to Primary School Booklet 2019 will be available electronically on the Calderdale Council website at the end of September 2018. Copies will also be available for you to view at your local library and primary school. The application process opens on 19 November 2018 and the close date is 15 January 2019. Offers of school places will be made on 16 April 2019. This entry was posted in Dec, Jan, Nov, Young People and tagged Calderdale Council. Please can you advice how I get an article published in this flyer please? Hi Jayne. It’s usually easier to email me on Stephen.Matthews@calderdale.gov.uk along with any references, images etc. I think last time when you asked us to promote the Elland Silver Band Community Fund application you did it through our Facebook page which is also a good way as I only work 2 days a week so other people can pick it up and action it.